Your information is out of date. Anyone can confirm your information is wrong by having a level 80 character with any of the 1-80 heirlooms (shoulders, chest piece, or Dread Pirate Ring). Before turning in a quest, compare the value of experience awarded with heirlooms equipped. Close the dialog box without turning in the quest, remove the heirlooms, and then go to complete the quest. The experience award will be the same. 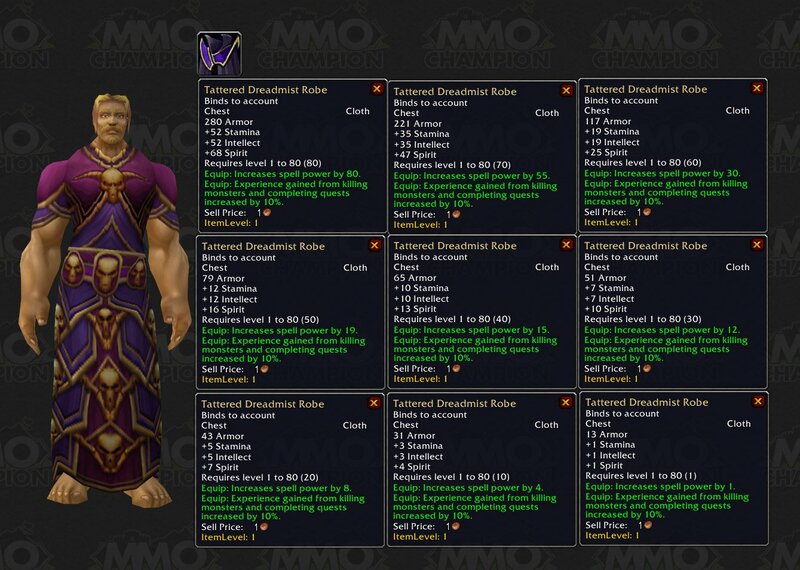 New heirloom for the upcoming patch 5.2 it will replace Tattered Dreadmist Robe for 2175 Justice Points. Edit: Why downrate true info? me getting it before wowhead does, doesn't make me wrong. This is the upgraded version of Tattered Dreadmist Robe. Upgrading to the level 85 version will cost one Tattered Dreadmist Robe and an additional 2175 JP. At level 80, the only advantage of this (and other heirloom items) is the experience bonus. The stats are vastly inferior to the greens available from the first few quests in Hyjal, such as Rockbreaker Robes. The stats seem to scale to Northrend levels until 81, then they scale to Cata levels until 85, where again the stats become inferior to questing greens. If you're not using your heirlooms while killing things, consider at least putting the +exp items in an item set for use when turning in quests. Be aware that you will lose any enchants on your Tattered Dreadmist Robe if you upgrade to this item.